Alternative Energy Group, LLC was founded in April 2010 by a group of business owners and engineers with the desire to bring new refrigeration technologies to North America. 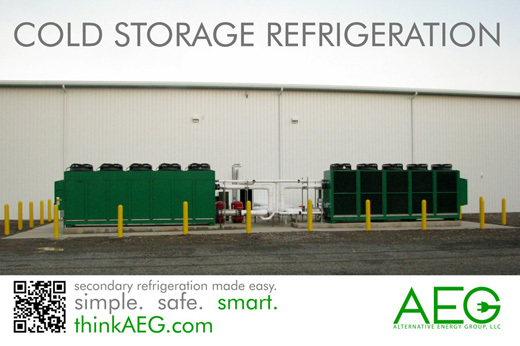 AEG uses chillers manufactured by Frigadon of Sweden and high-efficiency secondary fluids for the most hassle-free refrigeration systems ever seen in the apple storage community. With partnerships formed directly with building designer Storage Control Systems, Inc (Michigan, USA) and cold storage refrigeration contractors Van Ernst Refrigeration (New York, USA) and Versatile Refrigeration Ltd. (British Columbia, Canada), systems are designed specifically to match the customer's needs. Have a look at our brochure and feel free to contact us with any questions you have at info[at]thinkAEG.com!